Wildlife conservation groups are looking to lend a hand to tiny owls in Arizona's Sonoran Desert. In 1997, the the cactus ferruginous pygmy owl was listed as an endangered species under the U.S. Endangered Species Act, but was ultimately removed from the list in 2006. But it's time to return protection to these owls, according to the Center for Biological Diversity and Defenders of Wildlife. 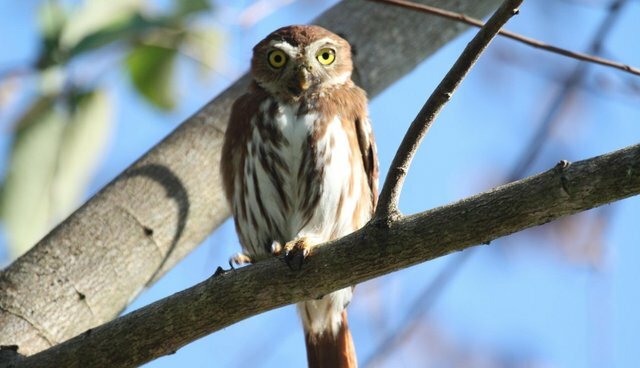 "With fewer than 50 birds in Arizona and steep declines in Mexico, there's no question pygmy owls need Endangered Species Act protection to survive in the Sonoran Desert," says Noah Greenwald, endangered species director at the Center for Biological Diversity, in a statement. "Instead these pygmy owls were wrongfully denied protection because they survive elsewhere. That's not how the Endangered Species Act was meant to work." Cactus ferruginous pygmy owls - reddish, 6.5-inch-long owls who munch on lizards and tunnel into cactuses - are more populous in other locations, and therefore no longer receive endangered species protection in any of the birds' habitats. The conservation groups filed a letter Monday stating their intent to sue the U.S. Fish and Wildlife service for increased protection for the Sonoran Desert owls, noting that the Endangered Species Act affords protection to "any distinct population segment of any species of vertebrate fish or wildlife which interbreeds when mature" and "is in danger of extinction throughout all or a significant portion of its range." The USFWS recently constricted what it means to encompass a "significant portion" of the owl habitat, according to Greenwald. "Sonoran Desert pygmy owls are unique and deserve our care," he says. "And protection of the pygmy owl has proven to be a benefit to the people of southern Arizona by helping to preserve native Sonoran desert habitats that are a source of solace and joy for many." In July, the House of Representatives passed a bill that would rework the way animals are classified as endangered. The Republican-backed bill aims to make the process more transparent, its proponents say; critics, however, contend that the revamped bill would result in a drastically weakened Endangered Species Act.